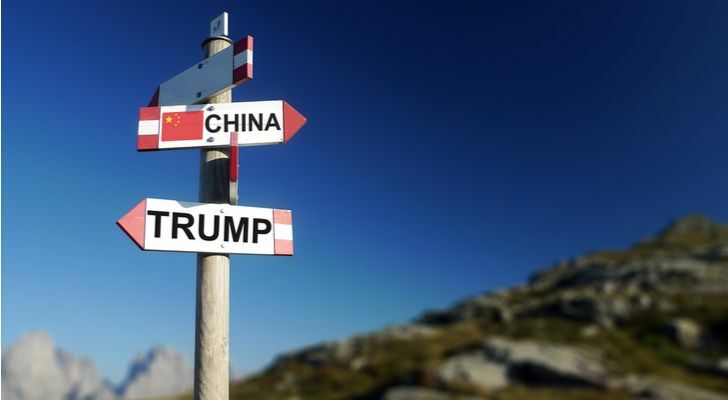 U.S. equities are moving higher on Tuesday amid a “sell the rumor, buy the news” dynamic following a tepid response by China to President Trump’s imposition of fresh tariffs on $200 billion worth of Chinese imports on Monday night. An additional 10% tariff will go into effect later this month, which will be increased to 25% in January. Beijing said it would be forced to retaliate. But failed to outline any specific measures. Which was taken by Wall Street to mean that they are backing down from the pressure. Later Tuesday, China started to outline its response. It formally complained to the World Trade Organization. And it reportedly is looking to raise tariffs on roughly $60 billion worth of U.S. goods at a rate of between 5% and 10%. Trump fired back that there will be more tariffs if China retaliates on U.S. agriculture and industry. U.S. equities are celebrating the news — likely, on a realization that Trump’s trade war will benefit American consumers and American companies and extract a good outcome when China decides to return to the negotiating table — while foreign stocks are suffering. Shares of Caterpillar (NYSE:CAT) are pushing up and over their 200-day moving average for the first time since June. More specifically, CAT stock is topping its late July reaction high and exiting a multi-month consolidation range. The company was recently initiated with a neutral rating by analysts at Oppenheimer, but I believe the stock is underappreciated as a play on industrial autonomy and connected capital assets. CAT will next report results on Oct. 29, before the bell. Analysts are looking for earnings of $2.82 per share on revenues of $13.1 billion. When the company last reported on July 30, earnings of $2.97 beat estimates by 23 cents on a 23.7% rise in revenues. Boeing (NYSE:BA) shares are rising into what looks dangerously like the right shoulder of a year-long head-and-shoulders reversal pattern. But after multiple touches of support at the 200-day moving average, watch for an upside breakout since there is nothing as bullish as a broken bearish setup. The company will next report results on Oct. 24, before the bell. Analysts are looking for earnings of $3.5 per share on revenues of $24.9 billion. When the company last reported on July 25, earnings of $3.33 beat estimates by 8 cents on a 5.2% rise in revenues. Deere (NYSE:DE) shares are bumping up against their 200-day moving average and look ready for an upside breakout from a level of resistance that’s been in play since April. In a note to clients back in August, Stifel analysts lowered their price target to $190 — which is nearly 30% of upside from here — noting that the company is successfully navigating an inflationary environment thanks to broad-end market demand and investments in things like telematics, digital products and customer support. The company will next report results on Nov. 16, before the bell. Analysts are looking for earnings of $2.4 per share on revenues of $8.6 billion. When the company last reported on Aug. 17, earnings of $2.59 per share missed estimates by 16 cents on a 35.9% rise in revenues. Shares of Chinese e-commerce giant Alibaba (NYSE:BABA) are threatening to fall to fresh lows and are already down 26% from their June high. The breakdown that started in late August and early September has pushed BABA shares out of a year-long consolidation range to return to levels not seen since the summer 2017. Company co-founder and executive chairman Jack Ma warned today that the U.S.-China trade battle could last 20 years or longer. The company will next report results on Nov. 22, before the bell. Analysts are looking for earnings of 93 cents per share on revenues of $13.01 billion. When the company last reported on Aug. 23, earnings of $1.22 missed estimates by 2 cents on a 61.2% rise in revenues. Shares of Chinese online shopping destination JD.com (NASDAQ:JD) have broken to fresh lows, returning to levels seen in late 2016 for a total decline of roughly 50% from the highs set back in January. The technical picture looks ugly, with a waterfall decline of its 20-day, 50-day and 200-day moving averages. The company will next report results on Nov. 15, before the bell. Analysts are looking for earnings of 17 cents per share on revenues of $15.5 billion. When the company last reported on Aug. 16, earnings of 33 cents per share missed estimates by 38 cents on a 31.2% rise in revenues. Shares of Baidu (NASDAQ:BIDU) are at critical support, threatening to fall out of a two-year trading range and return to levels seen in early 2017. From the high set in May, shares are down roughly 25%. The company has been hit not only by diminished chances of a big push into the U.S. market, but also by efforts by Google to launch a censored version of its search engine in the country. The company will next report results on Oct. 30, after the close. Analysts are looking for earnings of $1.9 per share on revenues of $4.3 billion. When the company last reported on July 31, earnings of $3.18 per share beat estimates by 59 cents on a 27.6% rise in revenues. Anthony Mirhaydari is the founder of the Edge (ETFs) and Edge Pro (Options) investment advisory newsletters. Free two- and four-week trial offers have been extended to InvestorPlace readers. Article printed from InvestorPlace Media, https://investorplace.com/2018/09/3-trade-war-stocks-to-buy-and-3-to-sell/.